Configuring e-mailing facility from Tally.ERP 9 is easy and simple because the user has the option to select some of the commonly used e-mail service providers and based on such selection, various details like Server Address, Port Number and Authentication details are pre-filled. In case you are using the e-mail facility of any service provider apart from the ones listed in Tally.ERP 9, then you can choose the option User defined, specify the respective details and start e-mailing reports instantly. On successful configuration of e-mail in Tally.ERP 9, you can mail ledgers, Pay Slips, Outstanding Statements, Confirmation of Accounts, Reminder Letters etc. to various parties/customers without even using an external e-mail application. 1. 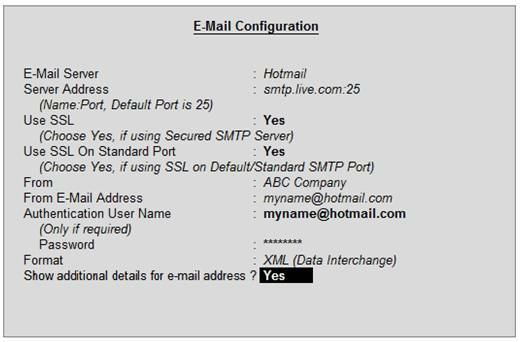 Select the required E-Mail Server from the list of Common Mail Servers displayed. Note: In case you are not using any of the e-mail services listed, you can select User Defined and provide the other details as required. 2. On selecting the required Common Mail Server, the server address and port number are pre-filled in Server Address field. 3. In the Server Address field, enter the name of your SMTP server followed by the port number (E.g., smtp.gmail.com:465 or smtp.yahoo.com:455). Contact the service provider or network administrator for further details. 4. Based on the E-Mail Server selected, the option Use SSL is configured automatically. This option is used to correspond over a secured network or send mails using secured mail servers. E-Mail Service providers such as Gmail, Hotmail and Yahoo Mail use a secured network/server to communicate. 5. 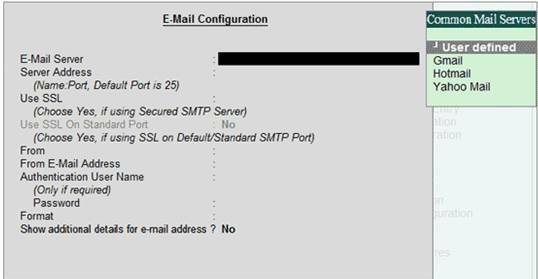 Based on the E-Mail Server selected, the option Use SSL on Standard Port is configured automatically. Some of the service providers use the default port (port 25) to communicate over a secured network. 6. By default, the From field displays the name of the company that is specified in the Company Creation screen. 7. The From E-mail Address field displays the e-mail address entered while creating the company. Enter your e-mail address, if you have not done so or if you want to change the e-mail id. This will not be updated to the company master or retained for future use. 9. Select the required attachment format from the list of Formats displayed. The attachment in the selected format is mailed to the recipient. The format available and their respective parameters are listed below; click the corresponding link to know more about each format. Set With Colour to Yes to retain the background colour in the exported file. 10. Set the option Show additional details for e-mail address to Yes to display additional details while selecting the e-mail address in the To E-Mail Address field or CC To field while e-mailing a report. Tally.ERP 9 is now configured to send e-mails.